One property of the extensive portfolio owned by Dr James Mayne and his sister Mary was the land in Queen St on which, in 1929, Brisbane's Regent Theatre was constructed. Designed as a "picture palace" in the American fashion, and able to host live theatre as well as movies, the Regent opened on 8 November 1929. 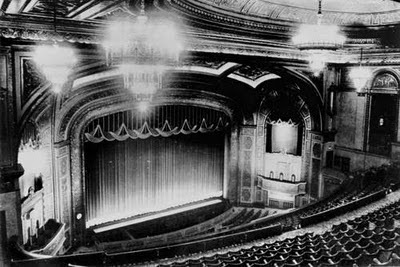 It was one of four Regent Theatres built in Australia during the 1920s, and featured a 2,500 seat auditorium (one of the largest in the country) complete with orchestra pit, organ, VIP boxes and chandeliers. 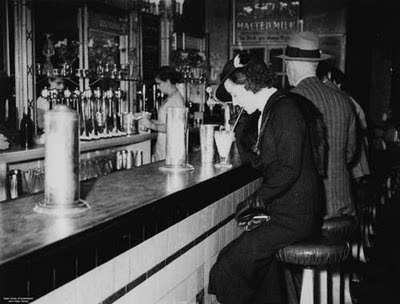 Here is what it looked like, when photographed in 1955. The opulence was also apparent in the foyer, which boasted gilded walls, a marble staircase and murals in the arched ceiling. Whenever I came here as a child, it was like entering another world. 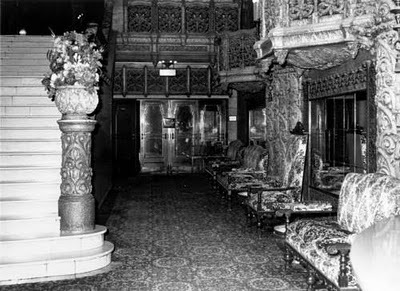 The ornate surroundings were indeed like a palace, and they were a portal through which you could enter the magic of cinema. Of course, there were other, more tangible treats available at the sumptuous milk bar, too. During the 1970s, the cinema chain Hoyts proposed the demolition of the Regent. Fortunately there was enough of an outcry against their plans that they were not able to proceed, although the magnificent auditorium was lost. It was converted into a four-cinema complex that opened in 1980. The entry foyer and staircase are now heritage listed. There is a coffee shop run by the Aromas chain at the entry. Unfortunately it does appear that the redevelopment saga has been reopened. It has been stated by the operators that the four-cinema configuration does not make money, and now there are plans for a multi-storey office block to be erected on this and adjoining sites, the Hilton Hotel and the Wintergarden shopping arcade. The State government initially rejected this proposal, but in the latest information emanating from George St the government appears to have shifted ground, as they are now saying that they should not sponsor a commercial venture that is not paying its own way. Current indications are that the cinemas will be gone forever, with the foyer retained as a facade and incorporated into the new construction. If you do not wish to lose any more of the Regent, you may be interested in the Save the Regent movement. There's lots more nostalgic information about the Regent in those pages too. My recent photos (above) show the exterior of the Regent (or as much as I could frame in my camera, given the profusion of food stalls now in the Queen St Mall), and samples of the murals and decor in the foyer. Please come to my blog to receive a well-deserved award. I love reading the material you have located and published. Thank you so much, Helen! I am thrilled to bits! It's dreadful that we've lost so much of our heritage here and that no one seems to care. Imagine this sort of thing happening in Hobart! Thank you very much for your interesting post and I hope that the Regent will be saved. Two of my childhood memories are of the beautiful marble staircase at the Regent, and seeing the film "Ben Hur" there, when it was first released. I will never forget either, particularly the chariot race on the big screen!